KM 125/130 R Bp 1280150205 https://www.kaercher.com/tn/professional/sweepers-and-vacuum-sweepers/vacuum-sweepers-ride-on/km-125-130-r-bp-1280150205.html Thanks to Tact filter cleaning, you can work using this ride-on vacuum sweeper almost without dust. The Teach System and optional sweeping crescent side brush also save time and resources. Thanks to Tact filter cleaning, you can work using this ride-on vacuum sweeper almost without dust. The Teach System and optional sweeping crescent side brush also save time and resources. Save both time and resources at the same time. 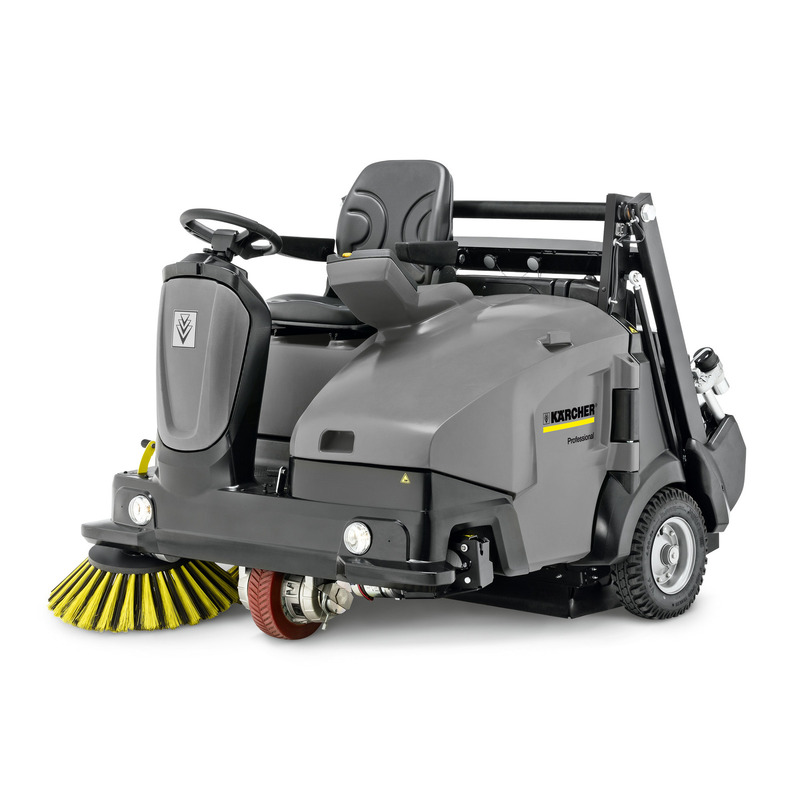 And if the KM 125/130 R Bp ride-on vacuum sweeper being fitted with environmentally-friendly electric drive isn't enough, you also save time and resources thanks to the well thought-out sweeping concept which halves the number of passes when sweeping corners compared to other machines. If you choose the optional sweeping crescent side brush, a single pass is enough to sweep corners, without any manual sweeping of corners. Even large steps can be passed over harmlessly since the main sweeper roller is placed between the rear wheels, while the Teach System monitors wear and tear, automatically adapting the roller to the height as required, always guaranteeing the best possible sweeping results. Three contact pressures can be set at the push of a button to accommodate different levels of dirt and types of surfaces. The patented Tact filter cleaning ensures dust-free work, and the Kärcher Intelligent Key System makes setting up different user privileges easy. The multifunctional display shows important parameters such as information about roller brush wear and the selected contact pressure.